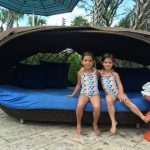 When we planned the trip to Disney World, we decided we wanted to surprise the girls with the trip, right before we left. Our flight was 6am the morning after Maggie’s 4th birthday, so we knew it would be extra special. 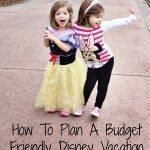 I saw a few fun ways to surprise kids with a Disney trip, on Pinterest, but I wasn’t sure my girls were old enough to get any of the ideas I found. I heard you could have Mickey call your house, but wasn’t sure how to do that. Then I had an idea: I could have a friend call pretending to be one of the Disney Princesses. As long as it wasn’t someone they talked to all the time, they would totally fall for it. I asked my good friend Meghan (she’s the one who guests posts with great recipes like this one) to work on her best Belle voice and prepare for her big call! She called right after cake on Maggie’s birthday. She told Maggie and Alex that Mickey, Minnie and all of the Princesses wanted to invite them for a special trip to Disney World. They were shocked, and beyond excited. Within minutes of the “big phone call” they were running around the house, packing every princess and Disney item they could find. The whole trip, Maggie was on a hunt for Belle. She wanted to thank her for inviting us. 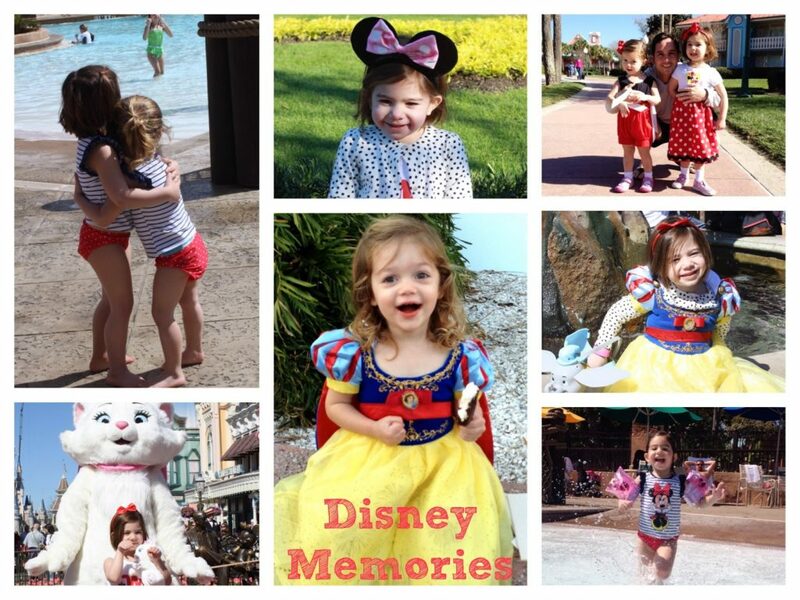 When we finally met Belle, she ran up to her and said “Thank you Belle, this is the best trip ever!”. We’re early risers, so I knew getting to the park right when it opened would not be a problem. A friend recommended being there first thing to see “Rope Drop” or the opening of the park. This was our first day in any of the parks and the perfect start to a Disney experience. Mickey & friends arrived on a train, there was music, dancing, etc. Maggie and Alex went crazy when Mickey hopped off the train and started waiving. Watching their wide eyes and huge smiles was the best way to start the day at the park! 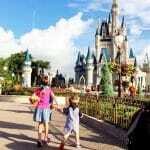 The very first thing we did when we entered Magic Kingdom was a “meet and greet” with Cinderella and Sleeping Beauty. 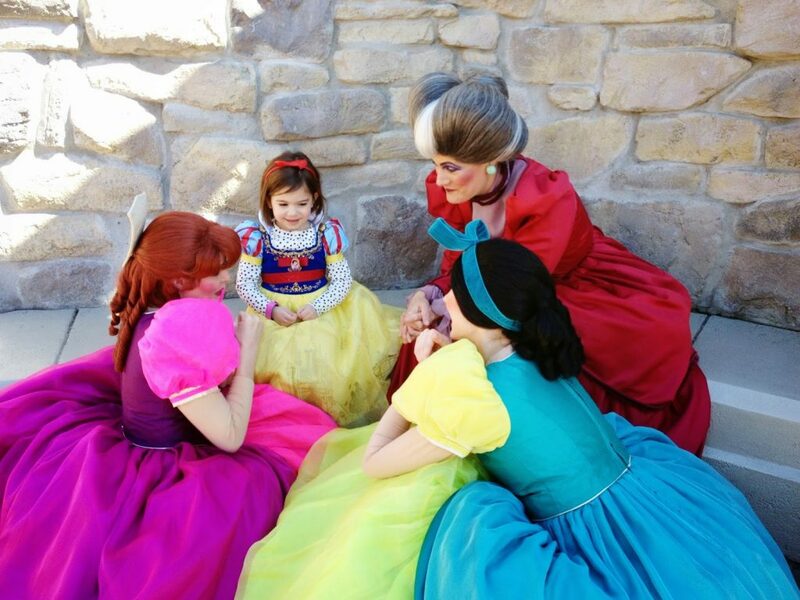 I booked one of our Fast Passes for this, as I knew they would really want to meet a princess when we arrived! This was priceless. 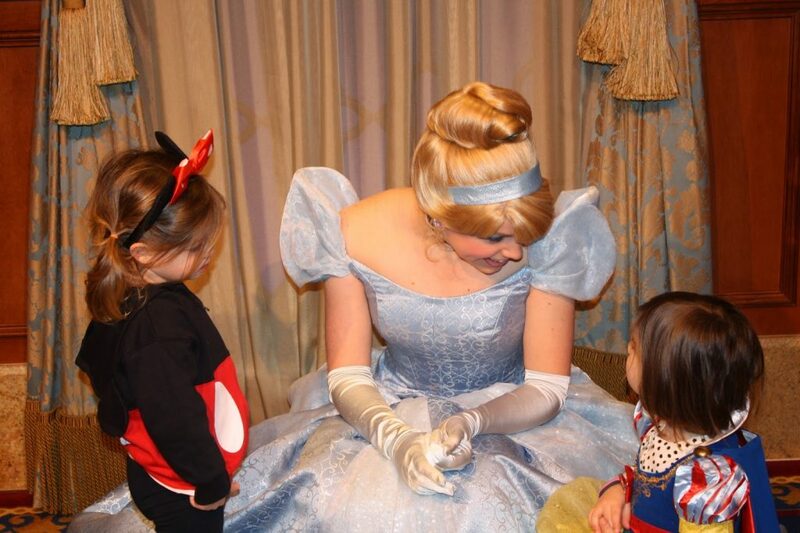 I loved watching their sweet faces when Cinderella invited them to come sit down and chat with her. The girls asked her about 100 questions and they talked about how all three of them loved pizza. Maggie and Alex starred at Cinderella in amazement the entire time. They could not believe they finally met a real princess. Maggie and Alex are huge Minnie Mouse fans. They couldn’t wait to meet her. We used a Fast Pass for meeting Mickey and Friends at Epcot. They knew we were going inside to meet Mickey and Minnie and couldn’t have been more excited. The characters were in order: Mickey, Goofy and then Minnie. 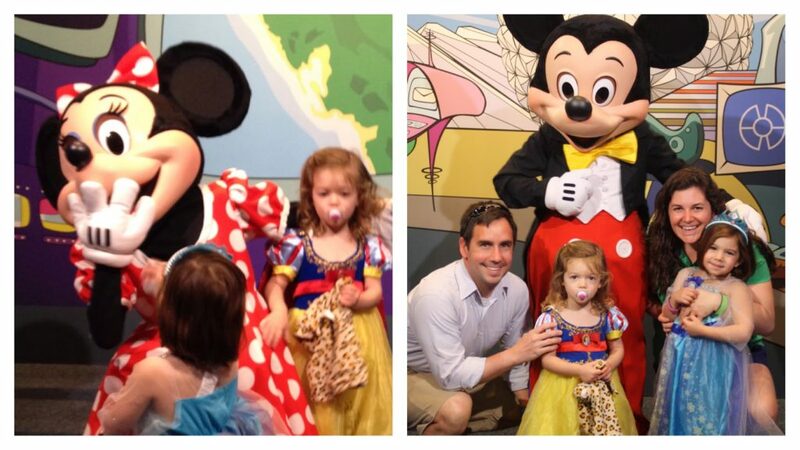 By the time they got to Minnie they were so excited they both ran to her. The characters are great at getting down low when little ones approach. 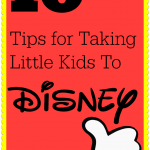 Personally, I think this helps with little kids not getting scared of the characters. Anyway, as Minnie attempted to get down on one knee to meet Maggie and Alex, they were running at her full speed. The result: Maggie and Alex tackled Minnie Mouse. 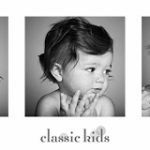 You can see her one glove going up to her mouth in an “uh oh” in our pictures. After that I had to drop the camera to help the Minnie Mouse pile up that had just taken place. On top of everything, Maggie had been eagerly awaiting an autograph from Minnie and had her book and pen ready to go. During the Minnie Mouse tackle, Maggie accidentally drew across Minnie’s face. Minnie’s “handler” had to stop the line after our kids to help Minnie get cleaned up before anymore guests got their pictures with her. I guess our crew was just a little too excited to meet Minnie! A great thing about Disney World, is even the Disney Villains make the kids laugh and smile. We were walking through Magic Kingdom when Maggie yelled “it’s the Evil Step Sisters and their mom!”. After that, they gathered around Maggie for a chat. She giggled and she made them laugh too. Maybe it’s all the bright colors, but this is one of my favorite pictures from the trip. We didn’t expect Maggie and Alex to understand how much it costs to go to Disney World; they are too young for that concept. Actually, they thought Belle footed the whole bill! We did however hope they would understand it was a special trip and not something you get to do everyday. I wish I counted how many times they each said “I just can’t believe this” while we were there. They said it over and over for different reasons, but for me it was their young way of showing us their thanks and understanding what a special trip this was for our whole family. Loved reading about your trip and all the helpful tools. I'm telling everyone I know to check it out! Can you tell me where you got the sweatshirt your little one is wearing? I love it and am interested in trying to make/buy for my little guy! Thank you.